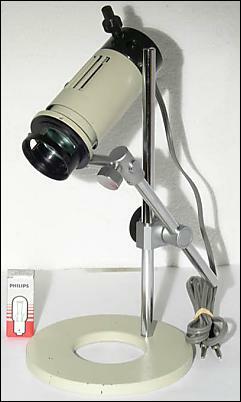 The Epi-Illuminator was produced by the Microscope Division of Olympus, and was designed for use with a stereo microscope. The lamp housing is attached to a short horizontal arm that allows it be tilted around a horizontal axis. The short arm is attached to a longer arm that can be adjusted vertically on a column attached to a heavy metal base, and that can also be adjusted for angle and extension. Incident illumination, from a variety of heights, angles and distances. 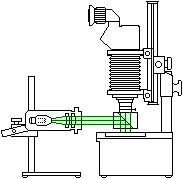 Coaxial incident illumination with a Mirror Housing. Requires a transformer. A lead from the rear end of the lamp housing terminates in two 4 mm “banana” plugs that fit the 4 mm sockets on the rear of the transformer. The version that was sold for use with the OM system is finished in a “hammered” medium grey, similar to the grey parts of the Auto Bellows and various other OM macro equipment. There is a newer version finished in a smooth, semi-matt cream. There may be an older version finished in a smooth, glossy grey. Supplied with 3 bulbs. Requires one of the Olympus transformers. A range of filters was available. Green, for increased contrast with some subjects and black-and-white film. Diameter 45 mm, no mount. Yellow, for increased contrast with some subjects and black-and-white film. Diameter 45 mm, no mount. Diameter 43 mm, in 45 mm mount. Older Olympus literature says that this filter is purplish blue, mired shift −80, for use with artificial light colour transparency film balanced for 3200°K and transformer at 5 volts. This correction is approximately equivalent to a Kodak Wratten 80C filter, which gives a shift of −81 mireds. More recent Olympus literature says that it has a mired shift of −131 and is equivalent to a Kodak Wratten 80A or Nikon NCB filter, for use with a 3200°K light source and daylight colour transparency film. There is also an LBD-2 filter, 45 mm diameter, no mount, that is not an interference filter. There is also an LBD-2N filter, 45 mm diameter, no mount, which consists of an LBD-2 filter cemented to a didymium filter. Didymium filters are used in color photomicrography to enhance the intensities and hues of specimens that have been stained with eosin, fuchsin and methylene blue. Blue, mired shift −45, for use with artificial light colour transparency film balanced for 3200°K or 3400°K and transformer at 6 volts. Diameter 45 mm, no mount. This correction is equivalent to a Kodak Wratten 82C filter, which also gives a shift of −45 mireds. Blue, mired shift −100. Diameter 45 mm, no mount. This correction is approximately equivalent to a combination of Kodak Wratten 80C+82A filters, which gives a shift of −102 mireds. Blue, mired shift −200, for use with daylight colour transparency film balanced for 5500°K and transformer at 6 volts. Diameter 45 mm, no mount. This correction is approximately equivalent to a combination of Kodak Wratten 80C+80B+82 filters, which gives a shift of −203 mireds. Light transmission 6%, exposure factor ×16, EV −4. Diameter 43 mm, in 45 mm mount. Light transmission 12%, exposure factor ×8, EV −3. Diameter 43 mm, in 45 mm mount. Light transmission 25%, exposure factor ×4, EV −2. Diameter 43 mm, in 45 mm mount. Light transmission 50%, exposure factor ×2, EV −1. Diameter 43 mm, in 45 mm mount. The LBD, ND-6, ND-12, ND-25 and ND-50 filters are constructed of 2 pieces of glass with a very small gap between them, and an interference coating on one of the internal surfaces. The interference coating is delicate, so do not press the two pieces of glass together when cleaning or holding these filters. 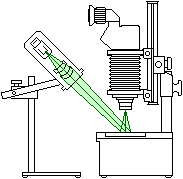 The rectangular 60×45 mm filters for the Trans-Illuminator do not fit the filter holder of the Epi-Illuminator.